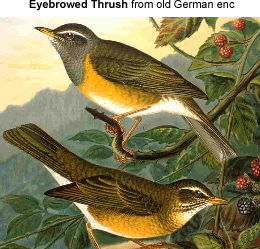 The Eyebrowed Thrush (Turdus obscurus) breeds in dense coniferous forest and taiga eastwards from Siberia. It is strongly migratory, wintering south to southeast Asia and Indonesia. It is a rare vagrant to western Europe. It nests in trees, laying 4-6 eggs in a neat nest. Migrating birds and wintering birds often form small flocks. It is omnivorous, eating a wide range of insects, earthworms and berries. This is an attractive thrush, with a grey back and head, the latter having a black eyeline, bordered white above and below. The breast and flanks are orange, and the belly white. The sexes are fairly similar, but immatures have a browner back. The male has a simple whistling song, similar to the related Mistle Thrush.